If we refer to product innovation and evolution, Servomech Group constantly releases interesting novelties on the market. Among them, a complete range of linear servo-actuators and electromechanical cylinders that, due to their characteristics of efficiency, accuracy and performances, represent a convenient solution to the problems concerning the use of hydraulic and pneumatic cylinders. All Servomech products are fully designed and manufactured inside the company’s productive plants at Anzola dell’Emilia (Bologna – ITALY). Today the manufacturing area of Servomech can rely on a total covered surface of 14,000 square meters. Product innovation, know-how, competences and total control of the entire manufacturing cycle (fully in-house accomplished), make Servomech Group a national and international reference partner in the implementation of solutions for the linear motion, in particular in the production of linear electro-mechanical actuators, acme and ball screw jacks, ball screws and nuts. Servomech has introduced several novelties into its production range, remarkably widening the line of existing products and especially releasing more advanced and complex mechatronic systems to meet the new applicative market requirements. Linearmech electromechanical servo-actuators are now available in execution with customized motor interface, inline and parallel motor mounting. 7 different sizes for a wide range of performances. The new range of electromechanical servo-actuators by Linearmech, brand of Servomech Group dedicated to automation and mechatronics, represents a real innovation for the customary users of pneumatic cylinders that need to manufacture increasingly fast, precise and compact machines, reducing energy consumptions and controlling all axes in centralized way. Linearmech servo-actuators Series SA have a fully modular structure and are available in different structural typologies to allow their utmost use flexibility. 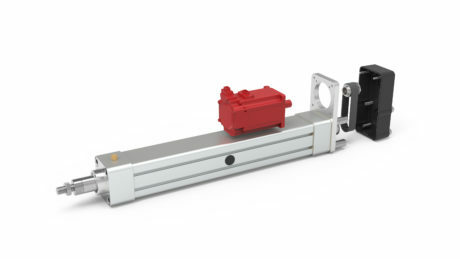 The only mechanical linear unit can be easily interfaced with the servomotors of the main brands on trade. Besides, it is available a complete servomotor package, still produced in-house by Servomech, with in-line or parallel assembly. Characterized by sturdy and compact structure, these servo-actuators adopt fully innovative solutions, ranking in the high-end segment of automation components. All internal parts have been purposely studied and designed to operate under conditions of high work dynamics: high linear speeds, low inertia of components, extreme positioning precision and repeatability, reliability and long life in time. Seven are the different standard sizes at disposal, with linear speeds up to 1,500 mm/s and maximum peak forces of 46 kN. 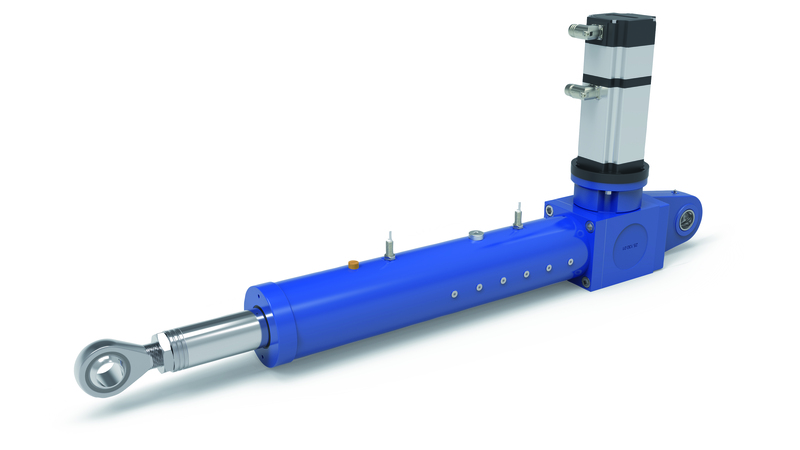 All servo-actuators are provided with ball screws in-house manufactured by Servomech (different precision classes are available depending on specific applicative requirements) and with a wide range of fixing elements according to the ISO 15552 standard of pneumatic cylinders, for a total and simple interchangeability with the existing pneumatic cylinders. Servomech is the only manufacturer of linear actuators relying on its own in-house production of all components, ball screws and nuts included. 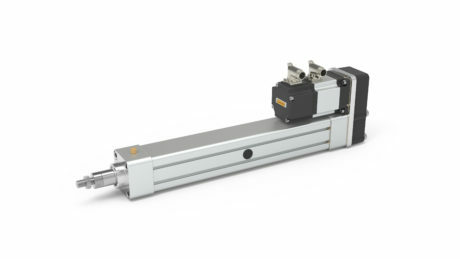 Thanks to this unique competitive advantage, Linearmech linear servo-actuators are the future of linear applications, a real, advantageous and innovative alternative to conventional pneumatic cylinders. Servomech new HSA Series high-speed linear actuators. Servomech introduces to the market the new HSA Series: linear actuators designed and manufactured to perform higher speed and load, always under the precise and accurate control of position. Lubrication is the most critical aspect in case of higher speed. For that reason, Servomech developed innovative solutions as the integrated sealing system and the re-lubrication system of the ball nut. Integrated anti-rotation device allows a fast and easy lubrication of the nut by simply call the actuator into the “homing” position. HSA Series linear actuators are driven by high efficiency and performances Gleason bevel gears. Ball screw linear drive, in-house Servomech production, from diameter 25 mm to 80 mm. 6 different sizes available at catalog, load capacity from 5 kN to 150 kN. Linear speed up to 1 m/sec. Standard stroke length up to 1.000 mm. Incremental or absolute encoder for positioning control, proximity limit switches for stroke end position. Prepared for IEC standard AC motors and brushless servomotors according to customer’s specific requirements.